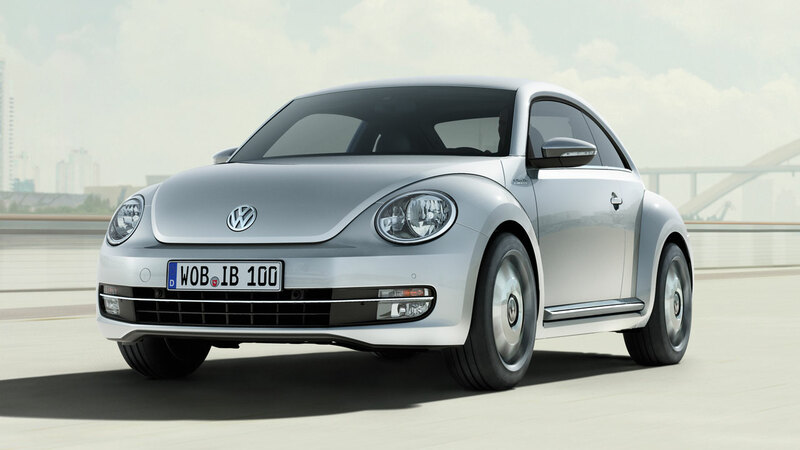 Two iconic products will form an alliance later this year: the iPhone from Apple, and the Beetle from Volkswagen. The iPhone will interface with the Beetle and Beetle Convertible via a specially developed app and a docking station. The iBeetle is the first model line from the Volkswagen Group in which the iPhone will become an integrated component. Volkswagen offers two different ways to acquire the innovative interface between iPhone and Beetle: as an app or as a standard feature of the new iBeetle and iBeetle Convertible. Both special models will be launched at the beginning of 2014. The app, docking station and iBeetle will make their world debut at the 2013 Shanghai Auto Show (20th to 29th of April). The newly designed docking station is located centrally on the dashboard of the Beetle: the iPhone simply snaps in to integrate it with the car. Essentially, all iPhone functions can be used in the Beetle; the iPhone can be used to navigate, make calls hands-free, listen to music, and much more. Spotify: lets users stream media such as new songs, customized playlists or online radio stations into the Beetle. Those who wish can post their favorite music directly to friends. In addition, users in the Beetle can switch between “Spotify” and “iTunes” at any time. Expert: offers five functions which make the iPhone an extended on-board instrument of the Beetle, such as a G-Meter (for measuring lateral acceleration), oil and coolant temperature gauges for the engine, a chronometer, and a compass. Trainer: can be used to compare driving times, distances, and fuel economy values for different routes between any two destinations. Here, too, tips can be posted via social networks like Twitter and Facebook—such as which route is faster to the office. Reader: lists the latest messages from social networks like Facebook, and reads iPhone messages aloud. Postcard: Sends the current location of the Beetle to friends as a digital postcard with a map motif. Photo: Sends photos taken inside the car to numerous social networks. Simply activate it, and the app does the rest. Milestones: Available when the smartphone is undocked. Rewards its users with virtual “milestone stickers” for the Beetle when certain tasks have been completed. The iBeetle is one of the first cars in the world to have a genuine integrative interface for the iPhone that was coordinated with Apple. As mentioned, the special model will be available as a Coupe and Convertible. The colors and equipment features of the iBeetle are stylistically linked to the Cupertino-based US company, bringing its iconic smartphones into harmony with what is certainly one of the world’s most iconic automotive designs. The iBeetle, which will be available in early 2014, will come with other customized features in addition to the standard iPhone interface. 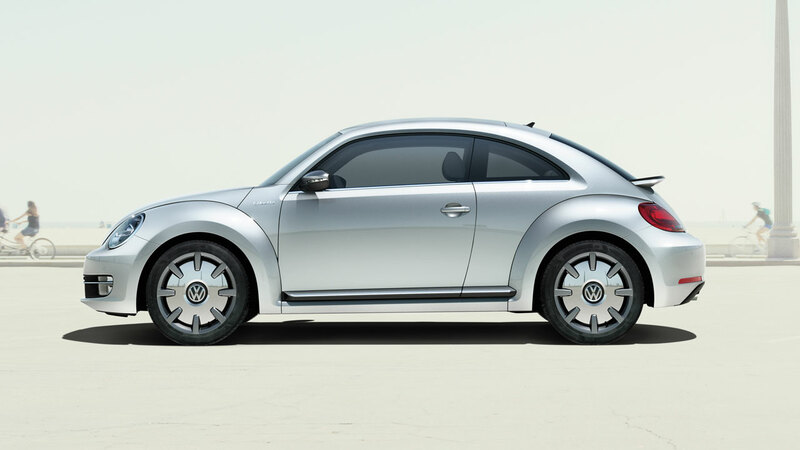 On the exterior, they include standard features such as 18-inch “Disc” alloy wheels (painted in “Galvano Grey” with chrome wheel covers), door mirror housings and side trim panels (above the sill) in “Galvano Grey”, black door sill plates with the “iBeetle” signature, “iBeetle” chrome badges (on the front fender) and a “Chrome pack” (includes chrome trim strips on the sides). In a nod to the iPhone’s color scheme, the new iBeetle can be ordered in “Candy White”, “Oryx White Mother of Pearl Effect”, “Black Monochrome”, “Deep Black Pearl Effect”, “Platinum Grey”, or “Reflex Silver”. Inside, steering wheel accents and the dash pad are executed in “Galvano Grey”. The iBeetle is also upgraded by a customized shift lever grip, black sport seats in “Vienna” leather, and contrasting seams in light “Ceramique”.